The Institute of Earth Sciences participates in the EVE project, supported by the UCPM-ECHO project of the European Union. The projects aims at facilitating the interaction and cooperation between scientists and Civil Protection Agencies (CPs) to timely anticipate to volcanic disasters. Built upon the previous EC ECHO funded project VeTOOLS, the aim of EVE is to combine the knowledge on the past eruptive behavior of the volcanoes with the analysis of real time monitoring in order to construct the European volcano EWS. EVE will offer an easy and rapid way to forecast in real time how, when and where a new eruption may occur, thus allowing to predict the most probable eruption scenarios and their potential impacts. EVE will facilitate scientific and technical cooperation at regional and international scales by defining common actions and protocols to forecast volcanic scenarios and their potential impacts, in real time during a volcanic crisis. Photo: The Icelandic representatives of EVE. 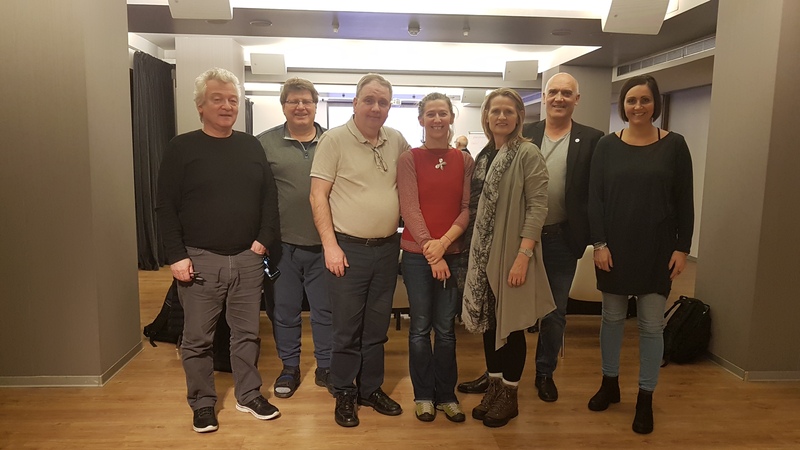 From left: Ólafur Helgi Kjartansson, Þorvaldur Þórðarson, Sigurður Guðnason, Sara Barsotti, Sólveig Þorvaldsdóttir, Ármann Höskuldsson and Páley Borgþórsdóttir.